Actor Aden Young has appeared in films such as Black Robe, Metal Skin, Cosi and Paradise Road. He was in the Sydney Theatre Company production of Hedda Gabler starring Cate Blanchett, the New York season of which featured in the ABC documentary In the Company of Actors. Most recently, he has been collaborating as editor with Paul Cox on Salvation and Kalaupapa Dreaming. “We both live in Sydney’s inner west in Marrickville and I met him when he shot his short film The Rose of Ba Ziz at our place last year,” says James Powditch. Powditch is a huge film buff and collects old movie posters. His portrait of Young is conceived as a giant billboard. The six panels are painted on paper then glued down like a movie poster in the street over other old posters. Film references abound. 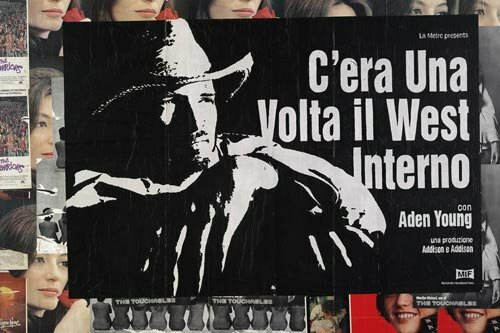 The title is a play on the Sergio Leone 1968 spaghetti western C’era una volta il West (Once Upon a Time in the West). Young, with his classic matinee idol looks, is depicted as a cowboy, echoing a famous image of Steve McQueen in Sam Peckinpah’s Junior Bonner. There are also references to Apocalypse Now, Reds and The Warriors. The text is a reworking of the original Once Upon a Time in the West poster and includes other little jokes: The (Marrickville) Metro is a shopping centre Powditch and Young both use, Addison & Addison refers to the name of the road where they both live. Born in Sydney in 1966, Powditch is well known for making inventive, witty mixed media constructions that incorporate painting, assemblage, collage and screen-printing. This is his first time in the Archibald though his portraits have hung in the Salon des Refuses for the last four years. He is also represented in this year’s Wynne and Sulman Prizes, in both of which he has been a regular finalist since 2002. He won the 2007 Mosman Art Prize and was a co-winner of the Blake Prize for Religious Art in 2005. A finalist in last year’s Dobell Drawing Prize, his work has also featured in the ABN AMRO Emerging Artist Award, Sculpture by the Sea and the Woollahra Sculpture Prize. He has been regularly included in the Year in Art Exhibition at the S.H. Ervin Gallery. He has held numerous solo shows and is represented in regional and corporate collections.